The genus Cassiope is a small one, with only about 12 species according to the AGS Encyclopedia of Alpines (only half of which might be considered to be in regular cultivation), although there are many more hybrids and cultivars. 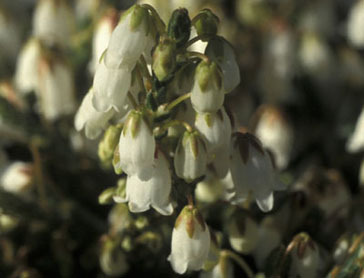 They are all small evergreen shrubs of the arctic, sub-arctic and high mountains of the northern hemisphere. They have small tightly adpressed leaves on wiry stems, and small pendant white flowers on short pedicels. 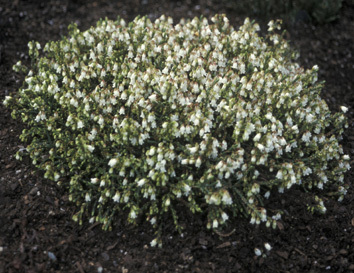 There are two main forms of growth, one with small mounds of which Cassiope lycopodioides is a good example, and the other upright as in Cassiope fastigiata. Certain conditions need to be met for successful cultivation. The first and most important is that they must never be allowed to dry out. If they do either death, or at the very least browning of the stems will follow. The easiest way to meet these demands is to grow them in a raised ericaceous bed, filled with leaf mould, peat or whatever you can get your hands on. When Pat and I constructed our first raised bed I kept one part for ericaceous plants, and fortunately this was in a part of the garden facing northwest and close to a hedge, so that although it gets plenty of light it does not get full sun all day. This was not great foresight on my part, but rather the happy coincidence of getting the right plants and the right conditions together, for Cassiopes and other ericaceous plants have done well in it. It is of course possible to grow Cassiopes in pots, and indeed raise them to top show standards, but that requires much more attention to watering. In a raised bed I only begin to worry after a rainless spell of two to three weeks, and start to reach for the sprinkler or hose. When, as is often the case here, the rain never ceases and I start to despair of my other alpines, I can at least rest assured that my Cassiopes are loving it. The bed is never covered, winter or summer, and the only attention "Kathleen Dryden" gets is a good haircut after flowering in April, and a working in of mulch into the entire rosette. This encourages new growth and the browning of the stems, particularly as the plant gets older is minimized. If desired a plant can be lifted and potted for shows, taking care not to crowd the roots into too small a pot. I have not noticed any detriment when replanted. After about eight years of steady growth in good conditions it can reach 36cm in diameter. The plants in the bed get an occasional ericaceous feed, and the whole bed is topped up if the level falls (as it slowly will). What is known of the origin of "Kathleen Dryden" is that it came from Randle Cooke, who had a garden on a north-facing slope in Northumberland. He passed it on to SE Lilley as "a good plant". It appears to be a hybrid with Cassiope lycopodioides as one of the parents. This shows as the determined horizontal growth at the edge of the rosette. The other parent is postulated as Cassiope fastigiata, and the growth in the centre of the rosette is semi-erect. As a matter of interest all the cultivars raised by Mike and Polly Stone in their garden at Askival in Scotland are natural hybrids, where two species not normally meeting in nature are brought together. It received a Preliminary Commendation when exhibited by Kathleen Dryden in 1969, when a one-year-old plant was stated to have reached 27cm across!! In 1971 it got an Award of Merit when shown by SE Lilley. Strangely there is no mention of it since then in the Consolidated Index to the AGS Bulletin (now the Alpine Gardener) published in 1993. In my experience it is a delightful plant, vigorous, free flowering and well worth any effort expended in cultivating it. I acquired it, along with many other desirable alpines, from Susan Tindall at Timpany Nursery (it is not listed in the 2003-4 RHS Plantfinder). Teasing out pieces at the edge of the rosette, which have roots, or by rooting stem cuttings in summer are the easiest methods of propagation.